From JCP website, typical adorable Nicole Miller print dresses. but haven't dropped by the department yet. 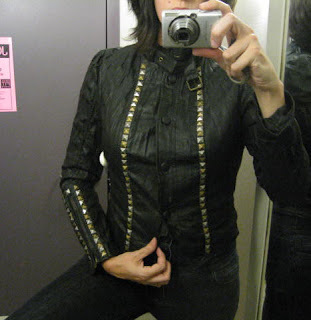 Instead, I've oddly now tried on this Allen B jacket twice: I'm posting more pictures of it later, because it's managed to lure me back to it again and again. Now it's on sale for under $50. And here's my problem, is it hideous, or kind of fabulous? I mean, it of course appeals to my bad heavy metal background, but my taste conscience is sorely tried by it. 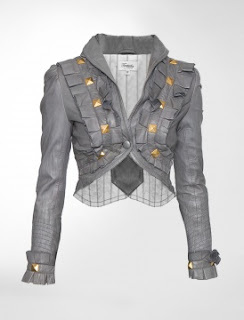 Then I was in Neiman's in Philly last week, and saw this Temperley London jacket: Aha! So not same-same, but I couldn't help but think of the Allen B again! Please go try this jacket on at Manhattan Mall after the Nicole Miller PA and give it to me straight. I need to either buy it or get this Allen B. out of my brain for good! Zac Posen Pop-Up: What's Left?